Our farmhouse is in Harvard, but many people don’t know that our apple orchard is in Boxborough. We were recently told by a neighbor about a proposed zoning overlay district in Boxborough that would change the zoning of our farm as well as adversely affect our neighbors in Harvard, Boxborough and surrounding towns. The proposed overlay district comprises 371 acres and will enable the Lincoln Property Company to build four warehouses, 1,020,000 square feet. These four giant ‘cubes’ would cover twenty-three acres of formerly forested land within several thousand feet of our property. Elizabeth Brook feeds the large wetlands area that flows around our orchard, and into the 500+ acres of Delaney Conservation area. In the last two weeks we have had two sightings of a bald eagle flying over the orchard and Elizabeth Brook wetlands. This proposed development would massively disturb this fragile ecosystem and threaten the aquifer that feeds our wells. Many of you who have been reading my blog know of the struggle I have faced in growing organic apples over the last few years. 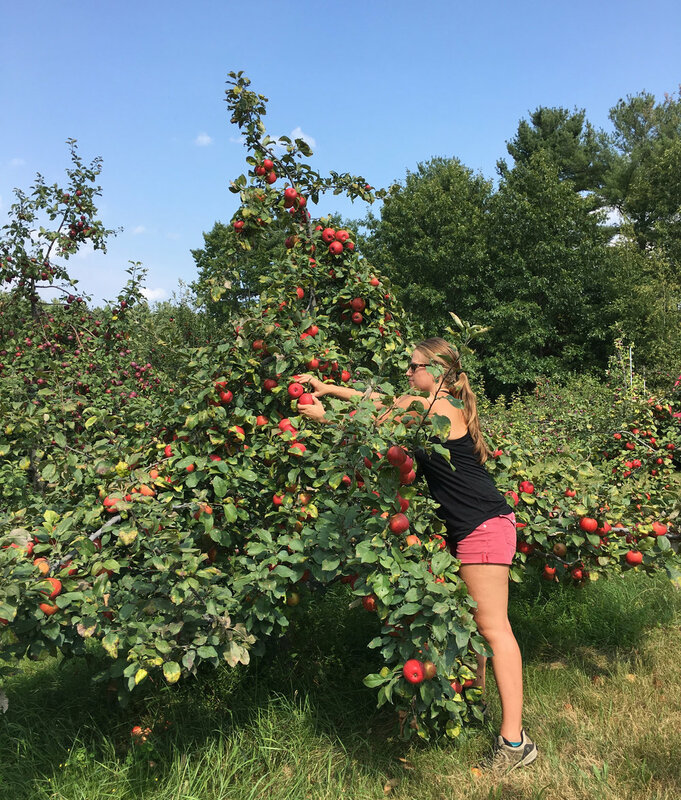 Climate change is one factor, but I recently learned of another issue when I attended the Holistic Apple Grower’s Meeting in Western Massachusetts earlier this year. A new fungus, Marssonina Leaf Blotch, causes apple leaf defoliation in apples when a fungicide is not sprayed throughout the growing season. Arriving in this country from Asia, it first appeared in the western part of the country, defoliating thousands of acres of aspens in Utah, but is now in New England. Orchards spray fungicides for scab, the fungal disease most serious for apple growers in New England where the summer weather is often warm and wet. Organic growers have less choice in sprays to control this disease, so I made the hard decision a year ago to remove our Macintosh trees, known to growers as scab magnets. Right after the trees came down, friends joined me to graft one hundred rootstocks with scab resistant apples. These one-year-old saplings grew well in our hoop house for the year and are ready to be planted. The disappearance of the gnarly Macintosh trees in the first few rows of the orchard caused neighbors to wonder if we were cutting down the entire orchard. I assured people we were not giving up. I have shared my lessons and strivings in growing organic apples, but none-the-less have continued to remain faithful to the trees and the land that have nourished me since I moved here in 2001. Giving up on the earth, our government, or any issue that is challenging doesn’t solve anything. We have to do the work and stand by our convictions. Liberty Property Company’s build might take ten years, and who is to say that in twenty years, these warehouses won’t be obsolete as everything will be drop-shipped. Tax revenue is an important consideration for all of our communities, but in preserving our towns’ rural nature, its conservation lands, farmland, wildlife, clean water and night sky we make sure that our town remains a desirable place to live and that our property values stay high. Warehouses will not serve the local community, and in fact will cause a serious disruption to our way of life. Many Boxborough residents heard for the first time about the proposed changes to their bylaw only recently. It seems that there has been a quiet, but legal effort to slip this bylaw change through Town Meeting by highlighting the ‘gifts’ to the town, but not mentioning the warehouses. If you know anyone in Boxborough, please make sure they know about this change in their bylaws coming up for a vote at Town Meeting in May. I look at the wetlands and the orchard now with a new set of eyes. The runoff into the wetlands might mean we can no longer irrigate. Boxborough neighbors say that with the twenty-acre solar panel array, phase one of Liberty Realty’s development plans, they hear Route 495 in their homes even with the windows closed. More traffic sound reflecting off twenty-three acres of roofs will certainly eclipse the twangs of red-winged blackbirds, chirps of robins and bluebirds, honks of geese, and squawks of herons. And it will be impossible to hear the apple trees. “They can speak, trees . . .” says the 14th century poet, Hafiz in his poem, An Apple Tree Was Concerned. that would help feed a poor family close by. Can't the clouds be generous with what falls from them? Can't the sun ration itself with precision? We face choices everyday about how we use the earth’s limited resources. Hugh Williams is an orchardist I admire. When I read his email reply to my recent blog about our difficulties with the apple crop, I knew I wanted to share some of his insights. I wrote to ask if I could quote him. “Of course you can use my name. More off-the-wall comments from an ignorant farmer!” was his reply. Hugh and his wife, Hannah Ball, and their two children grow fruits and vegetables and raise a small herd of cows at Threshold Farm in Duchess County, New York. Everything they do is touched by the biodynamic practices first introduced to the world in the early 1900s by the philosopher-farmer, Rudolph Steiner. Hugh started farming on his family’s farm in Australia in the early 1960s. He has learned through careful observation what his plants and animals need to flourish. I first met Hugh at the annual Holistic Apple Growers meeting in western Massachusetts. At the beginning of each meeting, Michael Phillips, the organizer and champion of holistic apple growing, greets everyone and suggests we go around the room and introduce our orchards. The first year I attended, Bill McKintley from Potsdam, New York, then the owner but now retired, of St. Lawrence Nurseries, began. John Bunker, who runs Fedco trees in Maine spoke next. John lives in Palermo, Maine, and is passionate about Maine’s heirloom varieties. Brian Caldwell, a grower in New York, is an organic vegetable researcher at Cornell University. He has two small orchards near his home. I was intimidated when my turn approached. Everyone was polite; no one hinted I might be getting in over my head. “How many trees do you have?” asked a handsome man with an Australian accent. That was Hugh Williams. When it was Hugh’s turn to speak, I remember he said he had been growing apples for forty years, and added coyly, “I’m waiting for the day I can be rid of my sprayer.” I wrote that down. I had written that our crop failure was in part due to biennial production because we don’t thin the fruit from the mature trees. Hugh answered, “For us it was mostly poor pollination. There were no insects, even on the dandelions!” Hugh and Hannah think it's a “global phenomenon” and referred to a “thinning” of the insects. Hugh reminded me that when you stop at a gas station today, there is no longer the need to clean your windshield. It used to be de rigeur, so many squashed insects stuck to the glass. Where did these bugs go? I never clean my windshield anymore. I think of the avalanche of toxic chemicals we have been releasing onto our planet every day since the end of World War II. The companies that made nerve gas and other toxic materials needed to change their product line in order to continue operating. Someone had the brilliant idea to manufacture chemical pesticides, herbicides, and fertilizers for the farmer. The corporate world is concerned with the bottom line. Inside brick and steel buildings, workers lose all connection to the natural world, to the subtlety of light, to beauty, to the richness of the insect, plant, and animal worlds, to the future of our children. There is an article in the July 25, 2014 issue of Science, Defaunation in the Anthropocene. Defaunation is a new word used to describe not only the disappearance of a species but the decline in numbers. Farmers like Hugh and Hannah Williams don’t need scientific studies. It raises the question of what actually is the function or purpose of agriculture, which certainly is not inherently tied to money, nor perhaps even to cropping! 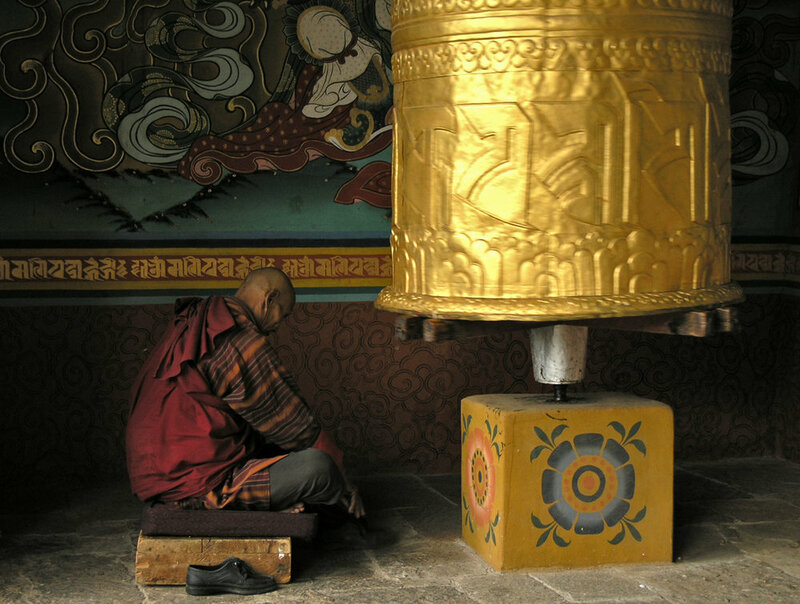 Our spiritual purpose becomes ever closer and more concrete. While yes, our farm is a temple precinct, we cannot avoid the conclusion it is also the very sensitive canary in the coal mine. Hugh’s spirituality infuses his farm and all who know him, providing deep sustenance to all creatures. He shares his ideas easily, even when they are counter to how much of the world thinks. I admire Hugh because he cultivates the physical demands of being a farmer—the hard work, the selling, the making a living—all with dexterity and wit, and he attends equally to the spiritual, with passion and reverence. Perhaps he would say, these two realms are connected, or are in fact, one and the same. Maybe, that is why his farm is named Threshold, a place of connection between inner and outer, earth and sky, the physical and the spiritual, the material and the ethereal. It’s the question I am most often asked, and it has become my least favorite question to answer. Have you ever been in this situation? That which you most don’t want to talk about is exactly what elicits the most interest. The old Zen saying—you find your fate on the road you take to avoid it—is apropos. No one asks, “How is your spirit, Linda?” A few ask, “How is the studio?” or about the children and about my husband, Blase. But a disproportionate number inquire, “How are the apples?” They know we’ve had some bad years. To the apples, then. Well, maybe. . .
You see, I just don’t want to write about them. I love the trees, the land on which they grow, the wildflowers, the seasons of their lives, the bare branches in the winter, pruning, the blossoms, the buzz of pollination. In 2015, we had a magnificent bloom and gathered for apple blossom viewing with shakuhatchi music floating out from a hidden speaker in one of the trees. The blossoms turned to fruit, and we had a splendid crop. But the truth is that 2015 was the last year we had a munificent harvest. In 2016, we had no fruit because of an early frost. Last fall, we had a bumper crop, but horrible scab rendered all our Macintosh and Golden Delicious apples unsellable. Out of the last four years, we’ve had one great year and one all-right year. We need to look honestly at what is happening despite the amazing 2017 Honey Crisp harvest. My daughter, Ariel, picking Honey Crisp apples in 2017. 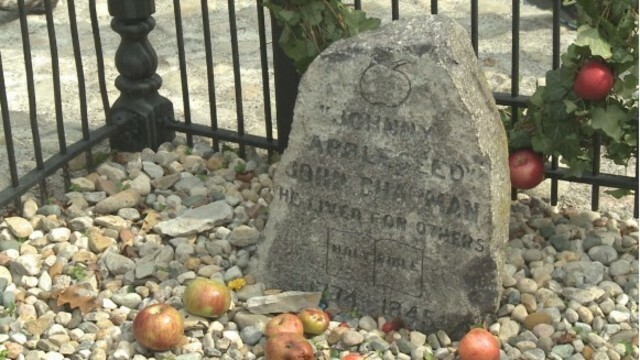 Growing organic apples was never part of a get-rich scheme. When I moved into the farmhouse in 2001, the abandoned orchard across the road and I shared many characteristics. I was hurt, confused, and without solid ground under my feet. The orchard grew brambles, poison ivy, but no fruit. Bringing back the orchard became an artistic as well as spiritual passion; it grew and flourished as I healed, grafting a new life. There is a great demand for local organic apples, and the orchard proved to be economically sustainable. However, our experience in recent years is changing the equation. Blase and I are questioning the orchard’s future. With a demanding schedule of time and resources for orchard care, growing organic apples on our scale is proving to not be sustainable. It’s not emotionally supportive: It’s downright depressing. And why aren’t there any apples this year? Among the multitude of interrelated answers, some I know and many I don’t. Thinning is certainly one reason. Most apple orchards thin their trees with chemical thinners when the fruit is only a few millimeters in size. This reduces the number of apples, fooling the tree into thinking it needs to produce a decent crop the following year to guarantee long-term survival. We thin our small trees by hand, too much fruit will impede healthy growth, but the mature trees are simply too big and too many so they produce a copious crop one year, and a pocket-sized one the following year—biennial production. I also think last year’s wildly successful scab fungi weakened the trees. Earlier this spring we took out seventy-five old trees—fifty Macintosh, the scab magnets, and twenty-five old. undesirable, meaning unsellable, Red Delicious trees. 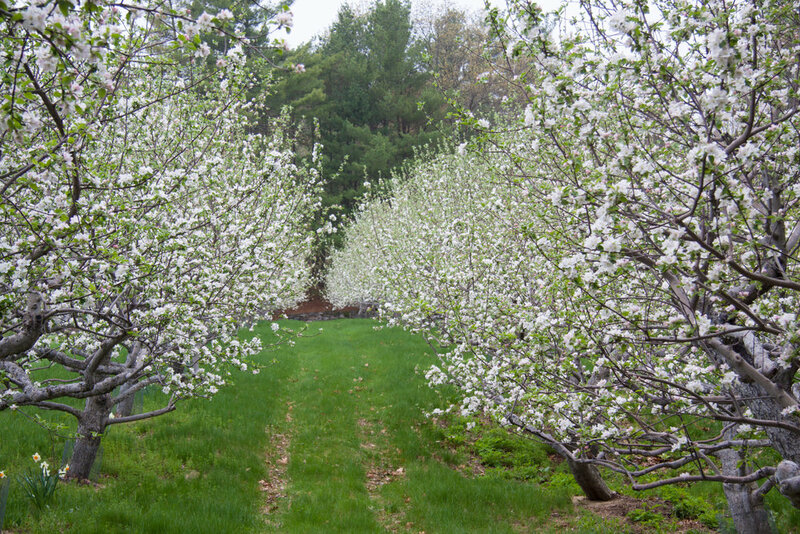 Fluctuating weather patterns accelerated by climate change are creating new challenges for orchardists and farmers in New England. Even though we have bees, the struggles facing our native pollinators makes pollination of apples in a cold spring a concern. Bees don’t go out of their hive unless the weather is over 55 degrees and they loathe rain. In spite of this litany, except for recent deer damage, the trees are leafy and healthy. Of course they are: No stress with no crop! But the inexorable problem remains—there is no crop once again. This orchard that has meant so much to me, fed and nourished many others for the last fifteen years, this orchard that has been my companion, my lover, and a great teacher, is not sustainable. We are caring for some four hundred trees, too many to do this work part-time and unprofessionally. If we had a small mixed orchard it would be different. What are we going to do? Blase and I are beginning to talk about how to make some kind of change. I have friends who decided reluctantly to move out of their house once their children fledged. 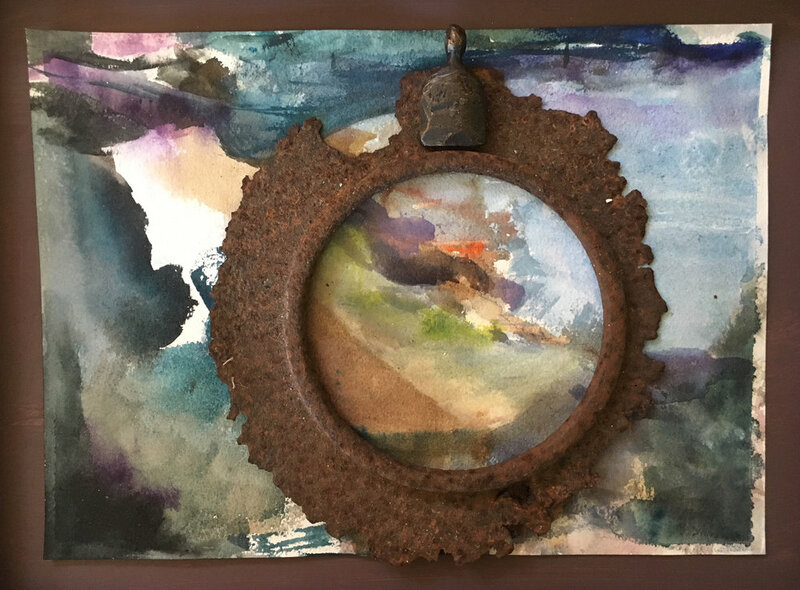 I have an artist friend who moved with her husband to San Miquel d’Allende, Mexico, where, because the dollar stretches further, they built a magnificent glass and stucco house and studio. But we don't want to move. We don’t want to leave the farm. Blase and I are both creating new directions as we live the decade of our sixties. Blase is organizing community events here and working with people one on one. He’s also returning more often to his woodworking shop in Maynard and fixing up his camp on the marsh on the North shore. He still tends a large kitchen garden and he repairs every dang machine that breaks, and they all do . . . . I work with our part-time women farmers, Holly, Julia, and Hannah three days a week. We pull invasives, pick fruit, weed, mulch, and create new planting beds. Strawberry harvest is over and blueberries are next. On the last 90 degree Friday, we netted the blueberry rows. We were so fried by the heat, I let everyone go home at 4 o’clock instead of 5, had a shower, and promptly collapsed, forgetting about my dear friend Marion Stoddart’s party (I am so sorry, Marion). Together, we also make art! Holly made a snake with all the sticks that needed to be picked up among the wildflowers near Paul Matisse’s Olympic Bell. Julia painted the signs for Which Way? Hannah has created some of our most memorable Instagram posts. Planning is underway for our 12th Annual Outdoor Sculpture Exhibit, and the artists will be installing their work in August. I love finding just the right location for each sculptor's work. This year, artist Anne Eder, known at the farm for her extraordinary installations of mythical creatures, will be overseeing her students from the Harvard Ceramics Studio with their own interdisciplinary sculptural installations. And my studio will be open on September 15 & 16th, part of the Bolton Harvard Open Studio. There is much work, both farm and art, to do. In some ways it is a relief not to have a big apple crop, I have more time for other projects. Yet, when I look at the photo of Ariel and the Honey Crisp apples, I cringe with disappointment—no apple-picking, no biting into juicy organic apples, no cider-making. What is our fate? And what road am I on trying to avoid my own? It’s right in front of me—and I can only say I am grateful.